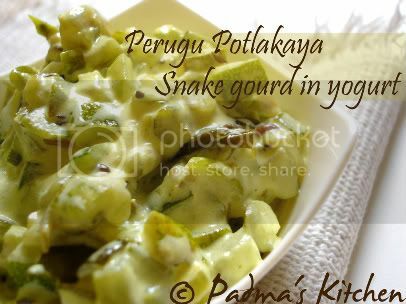 Perugu means Yogurt., Potlakaya means Snake gourd, together Perugu Potlakaya. Snake gourd is called as Potlakaya in Telugu, podalankai in Tamil, Padavalanga in Malayalam, Padavalakai in Kannada and Chachinda in Hindi. This is a healthy vegan recipe, quick to make and needs nothing much than few Indian seasoning items like mustard seeds, cumin seeds, blackgram dal and few curry leaves. I make this curry when the snake gourds are in season. We can also make using 'frozen Potlakaya'. I like to have this with Sambar or pappu charu along with company of hot steamed rice. This is very commonly prepared in South India, some add grated coconut and other sauté it simply. Clean snake gourd/potlakaya by scrubbing thoroughly some salt on its skin. Rinse in water. Cut into half and remove its seeds. Chop snake gourd/potlakaya into small pieces. Finely chop green chillies also. Heat oil in a kadai/medium pot. Add first three ingredients under tempering. Fry for a minute or till the blackgram dal turns reddish brown. Add curry leave and asafeotida/inguva and fry for a minute., then add finely chopped green chillies. When the chillies are cooked add chopped potlakaya/snake gourd and sauté till all flavours are mixed together. Add turmeric/haldi/pasupu and mix and let it cook by covering a lid on medium heat for 20 mins approx. When all pieces are cooked and curry becomes dry as water gets evaporated. Lightly whip some home-made yogurt, once the curry is cooled down or reaches room temperature, mix in yogurt and your Perugu Potlakaya is ready. Variation: You can use sour cream instead of home-made yogurt. Potlakaya /snake gourd in this recipe can easily replaced by Berakaya/ridge gourd. this is so healthy!!! love the idea of using your own homemade yogurt!